It was 2006 when I first made a journey up Chehalem Mountain in Newberg, Oregon, visions of Pinot Noir dancing through my head. As I arrived at a little slice of paradise with a sign out front reading “Rue de Privé,” I knew I had found a gem. Straddled behind a gate and visible on the north and south side of a home sat two well-groomed one-acre vineyards. A sport court and a boules court surrounded by lavender indicated some fun was to be had here. Heading up the driveway, I was taken by the cutest little French-styled winery I had ever laid eyes on. 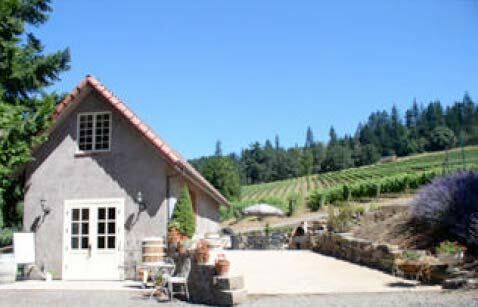 The owners, Mark and Tina Hammond, are American, but their Privé Vineyard is every bit French in name and character. The outstanding Pinot Noir made here also reflects a French pedigree. 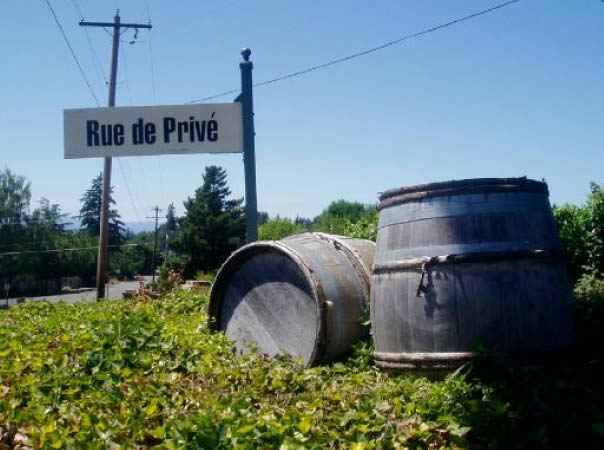 Privé Vineyard is one of Oregon’s smallest Pinot Noir wineries, producing approximately 250 cases of Pinot Noir annually since the first vintage in 2001. This is essentially a private winery for those lucky members of the allocation list. Mark is the vineyard steward and Tina is the winemaker and together they produce one of Oregon’s greatest cult Pinot Noirs that often appears on my end of the year All American Pinot Noir list. The pair joke that the division of labor is convenient because Mark can blame Tina and visa-verse if their is a problem with the outcome of the finished wine. Experienced pickers are hired at harvest, but otherwise this is truly a family run estate. Three wines are released: le nord, from the upper, northern one acre, le sud, from the lower , southern one acre, and a reserve, Joie de Vivre (joy of life) crafted in very limited quantities (half-barrel) and offered in beautifully etched bottles ($90). The Joie de Vivre is only made from the first pressing from each bin of fermented wine based on the belief that the most intense flavors of a grape are next to the skin and gentle pressing draws a juice that is slightly darker and more intense in flavor. The original Müller-Thurgau vines on the property are planted in Jory soil dating to 1980. They were grafted over to Pinot Noir beginning in 1995 with Pommard cuttings taken from Patricia Green at Autumn Wind. The vines are meticulously farmed organically, with only inorganic Roundup used as needed. Organic sulfur is used aggressively starting in the spring to avoid mildew. Precision viticulture allows secondary clusters to be removed by hand leaving one cluster per shoot. Yields are usually 1.5 to 2 tons per acre. The Hammonds' business model is such that a really bad vintage could severely hamper their income. Tina likes to joke, “Mark will have to get a real job.” They kid each other about what one would do. Mark thinks he might pump gas, because he loves outdoor jobs. Tina is a self-taught winemaker who has a knack for crafting Pinot Noir with heavenly balance. Last time I checked in with the Hammonds the grapes were meticulously sorted, 100% de-stemmed, not crushed, and fermented as whole berries in 1.25 ton plastic fermentation bins. A 4 to 5 day cold soak was usual. Usually 100% new French oak barrels are used for le sud which is a more cellar-worthy wine, while le nord is raised in a combination of new (15%), 1, 2 and 3 year-old French oak barrels. The moderate alcohols of the finished wines are appealing. 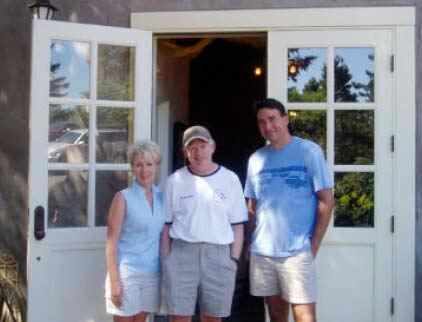 Talk about passion for making wine, quality of life and carving out a little niche of heaven. The Hammonds have got it right! Nord or sud, Privé is the answer to an elusive kind of romance. Privé Vineyard website is www.privevineyard.com. The website is in the process being updated and tasting notes on all previous vintages will be added along with the Hammonds' favorite pairing recipes. Customers are now limited to buying 12 bottles of each wine. The allocation list was filled years ago, but you can sign up for the waiting list and hope to get some wine in the future. You may find a bottle occasionally in the secondary market. In 2008, a Bordeaux blend of grapes from Washington, Melange, was produced for the first time ($29). A Pinot port is also available ($40). 503-554-0464. 13.5% alc., $49. · Moderate reddish-purple color in the glass. Lovely aromas of black cherries, black raspberries and a hint of exotic spices. Rich and forthcoming with a blackberry and black cherry core clothed in caressing tannins and possessing the right touch of balancing acidity. More lush and forward than the le sud bottling. A dreamy wine with a creamy texture that is approachable now but will benefit from more time in the cellar. If this wine was a lover instead of a wine, it is the one that would make you abandon your family, leave your job, and forfeit your hard-won position in the community for just one more fling. 13.8% alc., $57. · Moderate reddish-purple color in the glass. The nose exhibits plenty of green garden, Provencal herbs, brier patch and savory spice from the oak. A moderately rich berry core is very tasty with memorable midpalate saturation that picks up intensity with time in the glass. An herbal edge dominates the fruit initially, but the next day from an opened and re-corked bottle the fruit and spice came out to play with complete resolution of the herbal influence. Flat-out delicious the next day. 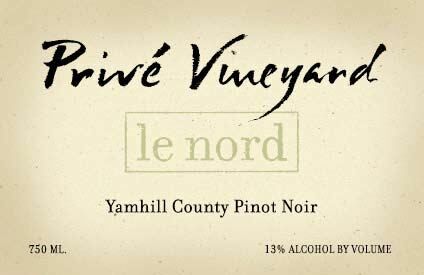 This wine is meant for aging while you drink the le nord, and will be every bit as good in 3 to 5 years. Very good (+).